A beautifully refreshing toner that harnesses the positive energy of sweet sage. This active, clarifying toner helps reduce the appearance of visual and open pores while providing balance and resurrection to your skin`s surface. Suitable for normal and oily skin conditions. Aqua (water), Lavandula officinalis (lavender flower) distillate*, Salvia officinalis (sage) distillate, Anthemis nobilis (chamomile flower) extract, Naticide (natural preservative), essential oil fragrances of lavender and sage: d-Limonene+, geraniol+, linalool+, coumarin+. + Component of essential oil, * Certified organic ingredient. Spray generously across your face, neck and décolletage several times daily for an immediate moisture boost and relief from environmental aggressors. Once you have cleansed, toning achieves the perfect skin preparation before applying your favourite Antipodes moisturiser. Colour and clarity may vary between products due to pure organic content. 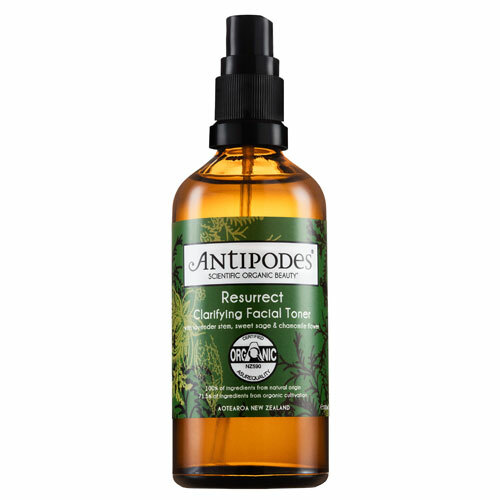 Below are reviews of Antipodes Organic Resurrect Clarifying Facial Toner - 100ml by bodykind customers. If you have tried this product we'd love to hear what you think so please leave a review. Reduce the appearance of visual and open pores while providing balance and resurrection to the skin`s surface.